After the death of Saint Genevieve, she was buried in the abbey Clovis built for her in Paris. From there, like the bodies of many saints, she certainly stayed active. In 847 the Vikings sacked her abbey, which was rebuilt in 1177 after her relics stopped a plague of ergot poisoning in 1129. In 1222, the Pope decided that the abbey was too small to accommodate all the pilgrims and the site required a full church. Work began on Saint-Ètienne-du-Mont, the future home of Saint Genevieve’s relics, though originally named for and dedicated to Saint Stephen. With the establishment of the Sorbonne nearby in 1257, the population in the Latin Quarter grew rapidly, so they just kept adding on to the church. It was finally completed in 1537. Skip to 1744 when Louis XV becomes seriously ill during the War of Austrian Succession. He vows that if he recovers, he’ll build a church worthy of the Patroness of Paris to replace her original abbey (which by now is falling apart). He recovers and makes good on his promise. Work begins on a building just across the street from Saint-Ètienne-du-Mont - the building that’s now known as the Pantheon. The grand church is completed in 1790, just in time for the French Revolution. The following year it secularizes, as does Saint-Ètienne-du-Mont, which becomes the Temple of Filial Piety. In a macabre demonstration of the revolutionary regime's judicial authority, the Saint's bones were put on trial and condemned to public burning, their crime being the "[participation] in the propagation of error." Having been subjected to a revolutionary auto-da-fé in Paris' Place de Grève on December 3, 1793, Saint Genevieve's ashes were sanctimoniously cast into the Seine. By 1801 Saint-Ètienne-du-Mont is restored to the Catholic Church. What’s left of Saint Genevieve’s relics, some dust and the stone her coffin rested on, are enshrined in their current location there. The Pantheon flips back and forth between the church and state a few more times before finally settling as a secular crypt for French luminaries in 1885. There’s one additional bit of lore about Saint-Ètienne-du-Mont that you won’t find in the guidebooks, but I read about in an occult book a while ago. 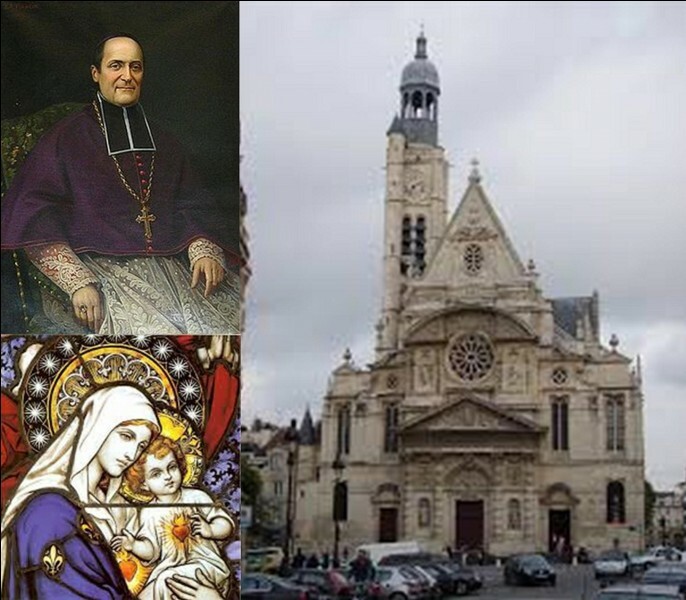 On January 3rd, 1857, the Archbishop of Paris, Marie Dominique Auguste Sibour, was assassinated here, being the feast of Saint Genevieve. Three years earlier, Pope Pius IX issued a papal bull that formally defined the Catholic Church’s views on the Immaculate Conception. Archbishop Sibour upheld the bull and promoted it in Paris. A ne’er-do-well priest named Jean-Louis Verger saw this as the Archbishop promoting idolatry and stabbed him to death as he lead a novena to Saint Genevieve. Verger shouted, “Down with the Goddess!” as he killed the Archbishop, a possible reference to both the Saint and his stance on the Immaculate Conception. darkness which one wishes to evoke. feather of its left wing. Dry the tongue and the heart, and reduce them to powder. Eat no meat and drink no wine, that day. On Tuesday, at dawn, say a mass of the angels. the consecrated wine, certain diabolical signatures (those of Mr.
Home's pencil, and the bloody hosts of Vintras) . alone, in the church, begin the office of the dead. Mingle with this office infernal evocations. male lamb of nine days old...."
As Levi says, "The hand refuses to write the rest." Levi said he refused the request of Verger. 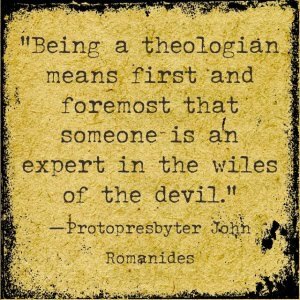 But who had sent Verger to Levi? And how did he acquire the book? A few weeks after the crime, Levi was speaking with a bookseller of the occult sciences, who informed him that it was he who sent him to Levi, but when he refused he returned to the bookseller who found a copy and sold it to the priest for a hundred francs, confirming that indeed the priest intended to use it to conjure the devil. Verger, for his part, freely admitted to murdering the archbishop and believed he would not be found guilty. He was, in fact, found guilty the very day of his trial a few week later. Ever confident, he was certain the Emperor Napoleon III would pardon him. He didn’t and Verger was dead by guillotine by the end of the month. He did have time however to confess to a priest and return to his Catholic faith. Having spent a good thirty minutes in the church and completed my goals, I hurried back and was able to catch my cab to the airport. This had been my last stop in Paris.